I recently received an email from Kobold #1 (Shelly Baur) asking if I wanted to review their newest release The Kobold Guide to Game Design Volume III: Tools & Techniques for the Neuroglyph Games Journal. Now aside from the lofty sounding title, I was a bit unsure about doing a review, as my focus on the Neuroglyph Games blog site has always been 4th Edition Dungeons & Dragons and GSL products, and a book on game design theory did not seem a likely candidate. But when I mentioned my reservations, Shelly assured me, “Yes, anyone who designs even part of their own games should be able to find something in this book.” Well that seemed reasonable to me, and I have been perusing the essays found in The Kobold Guide to Game Design Volume III: Tools & Techniques, with a mind on how this can help 4E Dungeon Masters in their campaign and adventure design. The Kobold Guide to Game Design Volume III: Tools & Techniques is a manual of twelve essays written by some very distinguished game designers in the RPG Industry. Contributors include Wolfgang Baur, Monte Cook, Ed Greenwood, Rob Heinsoo, and Colin McComb, and they provide a series of short essays on everything from general game design theory to combat system design to dealing with failure. 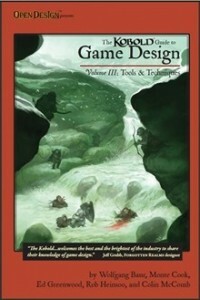 The Production Quality of The Kobold Guide to Game Design Volume III: Tools & Techniques is very good, with each essay presented in a straightforward format, although the length, depth, and long-windedness of each article varies considerably. 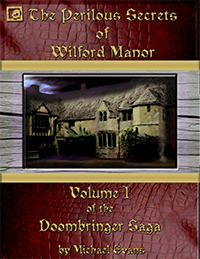 There are no illustrations save the front cover, although the title page included a chuckle-worthy drawing of the infamous “Kobold” turned Cthulhu-cultist – particularly given Rob Heinsoo’s essay “Seize the Hook”, in which the former Chaosium employee admits that he is not a fan of H.P. Lovecraft! Blasphemous!!! While reviewing this ebook, I quickly came to realize that there’s a lot of good material and ideas in here, but sadly not all are useful for Dungeon Masters wanting to make their 4E games better. So with that in mind, each essay is given its own short review, with an eye for application to 4th Edition Dungeons & Dragons. Discusses the elements required, in general, to design a new game of any type (computer, board, rpg, card) from the ground up. While interesting for someone looking to design a new game from the ground up, with its own concepts, rules, and systems, it is not particularly useful for a DM looking to design his next adventure. Some of the the Author’s ideas might help if you are a DM working toward creating an entire campaign setting, but the essay is rather long winded to go picking through it with world-building in mind. Interesting discussion detailing the difference in designing a tabletop rpg and a computer rpg, from a just a single encounter up to a campaign. It was intriguing how the Author demonstrates that the encounter description of “You enter a 10-foot x 10-foot room here. There is an orc here. It is guarding a treasure chest.” means a lot of different things if you’re a computer programmer rather than an RPG writer. Regretfully, there is not a lot here which will help a DM plan his next adventure or campaign. Although a bit esoteric at times, this essay has some solid ideas in it about developing one’s own creative process. The Author offers some theory here based upon David Kord Murray’s Borrowing Brilliance (Gotham Books, New York, 2009), and applying it to “teaching” creativity. He gives a nice example of how this “creativity theory-craft” helped him in his work on Open Design’s Courts of the Shadow Fey. The Author describes the process of bringing an idea from brainstorming to manuscript to finished game product – or at least as far as the writer needs to work before handing his “baby” over to the brutal hands of the editors and publishers. As a game designer and publisher myself, I could identify a lot with this essay, and I have known what Wolfgang describes “the muddle in the middle” all too well! But this discussion will have little use to 4E Dungeon Masters, unless they plan to get onto the GSL roller-coaster and start publishing material themselves. Here’s another great essay which sadly has little to offer the work-a-day 4E Dungeon Master. The Author’s discussion of the three mechanics of game design is really fascinating, and sprinkled with plenty of experiences from Rob’s past design experiences. But again, this essay is more focused toward game designers planning their own unique and new product, and offers little practical advice to a DM. This essay looks at the creation of a combat system, and the “nuts and bolts” behind it, such as probability trends, statistic bonuses, and all the other moving parts that one can use to resolve a combat encounter. If you’ve never thought about how a combat system functions “behind the scenes”, this article is a fun read. Colin even offers a sample combat system to work from, giving a rich understanding to how complex systems can become. But unless you plan to revamp the 4E combat system entirely, this essay offers little to Dungeon Masters looking to improve their game. Finally, we have an essay that delivers a message to 4E DMs! Ed’s discussion of his campaign design is enjoyable to read, and has some great advice to Dungeon Masters looking to tie story elements together by using villains and evil schemes to make the their Player-Characters truly feel like “agents of change”. Admittedly, some of the advice found here is available in the Dungeon Master’s Guide and Dungeon Master’s Guide 2, but Mr. Greenwood’s essay is still a good read. Here’s another essay has solid advice to Dungeon Masters, whether they are designing a single adventure, or an entire campaign, or even a campaign setting. The Author makes several good points about using unusual terrain, exotic locales, and other world features as key elements in their design. And while certainly, D&D 4E gamers will agree with the Author, again, many of the ideas have already been discussed in the DMG and DMG2. Here’s a brilliant discussion unmasking the lie behind the words “game balance”. Well, perhaps not the lie, but rather what the Author refers to as a failure of many gamers and game designers to realize what “game balance” really is. I’ve recently delved a bit into that topic with my blog on the fine line between Character Optimization and Game-Breaking Characters (Character Design: Optimized or Game Breaking? ), and Monte’s discussion has some interesting thoughts whether you’re a game designer, or simply a DM trying to keep his own campaign in the balance. I really enjoyed this piece by Wolfgang, as it offers some interesting ideas to adventure as well as game design. The Author discusses the various types of “sandbox” style adventures and campaign designs, and they differ (or not) from a more linear plotline. This is definitely worth a read by DMs wanting to expand their adventure design concepts, and to present their Players with a different style of questing. Here’s an essay which is unlikely to be useful to most Dungeon Masters, unless they run their game with multiple DMs. And certainly there are some game groups out there where DMs switch off from one adventure to the next so no one has the sole burden of the campaign on his or her shoulders. If that’s the case, then this article might be useful, as it discusses how to handle collaboration in design. The Author offers advice on how to successfully collaborate so that multiple designers are working effectively with each other. But again, with so many game groups being lead by a single monolithic DM, this essay does not offer a lot of 4E advice. This last essay has some advice on how to handle failure, and how to make the most of it, and even make a recovery from it. Although written with a game designer in mind, there is still a few choice bits in this article regarding dealing with failure – which can (and will) happen at the adventure or campaign level to any Dungeon Master, regardless of experience! From a D&D 4E perspective, The Kobold Guide to Game Design Volume III: Tools & Techniques is not a big “must have” item. The essays, while well-written and enjoyable to read, are not readily applicable to Dungeon Masters and Players of 4E. And although some of the essays contain sage advice from noteworthy game designers, many of the bits applicable to 4E DMs have already been discussed in the DMG and DMG2. So if you are a budding game designer, or are a writer looking to break into the GSL or OGL or Pathfinder market, The Kobold Guide to Game Design Volume III: Tools & Techniques is a worthwhile read. The essays offered in this ebook can give fresh perspective and advice from some leading game designers in the gaming community. And I would hazard to say, for the price, this certainly is a great resource for self-publishers out there, looking for some guidance before they leap into the murky waters of game design. Editor’s Note: This Blog’s Author received a complimentary copy of the product in PDF format from which the review was written. The Secondary Grades below are given from a non-4E perspective, and their values reflect the usefulness from a general game designer point-of-view. This entry was posted by Editor-in-Chief on Friday, June 18th, 2010 at 8:57 am	and is filed under Dungeonmasters' Insider, RPG News & Reviews, Tricks of the Trade. You can follow any responses to this entry through the RSS 2.0 feed. You can leave a response, or trackback from your own site.